The European Commission has approved Ipsen’s Cabometyx as a first-line kidney cancer treatment. Cabometyx (cabozantinib) has been given the green light as 20, 40 and 60 mg pills for the treatment of adults afflicted by intermediate or poor-risk advanced renal cell carcinoma (aRCC). The drug, a tyrosine kinase inhibitor, looks set to become the core product in Ipsen’s cancer franchise. First quarter results show the drug is heading for success, with sales of 28.2 million euros (£25 million). Harout Semerjian, executive vice president and chief commercial officer at Ipsen, said: “Today’s EC approval is a step forward for advanced kidney cancer patients in Europe who will be able to access a new oral first-line treatment option that offers significant improvement over the standard of care. The approval for use as a first-line therapy was based on the Cabosun trial, which demonstrated that Cabometyx significantly prolongs progression-free survival (PFS) compared to Pfizer’s Sutent (sunitinib) in treatment-naive aRCC patients who are deemed intermediate or poor-risk. It is the first and only monotherapy to demonstrate superior clinical efficacy over sunitinib in this group of patients. Patients treated with Cabometyx had a median PFS of 8.6 months versus 5.3 months for those treated initially with sunitinib, marking a 52% reduction in the hazard for progression or death. Cabometyx was approved in the EU in September 2016 for the treatment of aRCC in adults following prior vascular endothelial growth factor (VEGF)-targeted therapy, an indication where it competes with Bristol-Myers Squibb’s Opdivo (nivolumab). 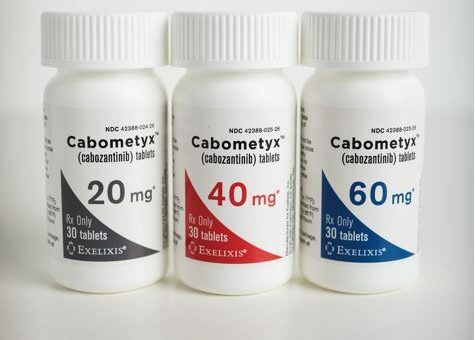 As a first-line treatment, Cabometyx could come up against BMS’ combination of blockbuster Opdivo and Yervoy (ipilimumab), if the cocktail is approved by European regulators. Cabozantinib is also approved in Europe under the brand name Cometriq and is used to treat adult patients with progressive, unresectable, locally advanced or metastatic medullary thyroid cancer.